Height adjustable bathtub Avero Premium UNUSED demonstrator 20% off and 2 years guaranteed! This Avero Premium height adjustable bathtub has been carefully developed with the most recent requirements. 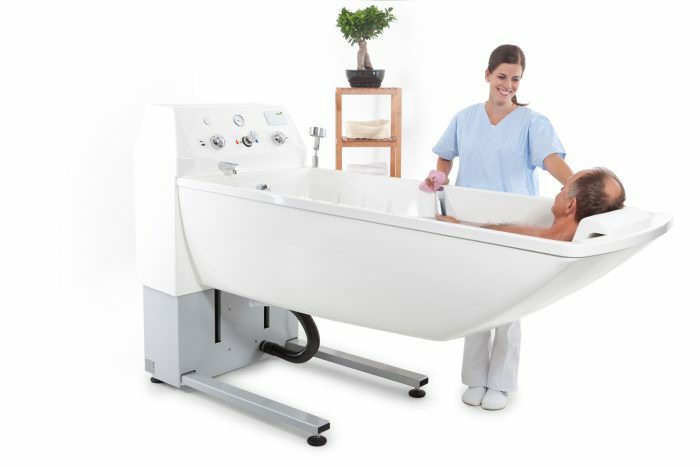 The ergonomic shell, inclined leg section and the quality of the materials contribute to provide the patient a relaxing bath experience. The use of this stylish and modern bathtub is simple and reliable, which reassures the nursing staff while offering the highest security for the residents. Equipped with several options including a preset level automatic filling system, a digital display of water temperature and a built-in disinfection spray, this demonstrator tub offered at a discount offers an incomparable quality/price on the market! Contact us for more information!